The Shenzhou-6 manned spacecraft is scheduled to launch in 2005. Meanwhile, LYC¡¯s products will fly to outer space once more. Since 1992, LYC have taken the responsibility of developing bearings for the Shenzhou Series spacecraft. The high-tech and high precision bearings with thin rings won LYC great honor from related departments. Products from LYC has become the authorized components for Shenzhou series spacecraft. The LYC bearings for Shenzhou-6 spacecraft have to face the challenge of long time working in weightlessness, which could be the biggest trouble. 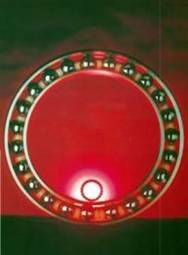 But the testing outcome indicated that LYC bearings have met all the special requests. It's reported that the assemble work of Shenzhou-6 spacecraft will be finished in July or August and it will be launched in September or October.